From the back cover: Endearing, self-absorbed, seventeen-year-old Cécile is the very essence of untroubled amorality. Freed from the stifling constraints of boarding school, she joins her father-a handsome, still-young widower with a wandering eye-for a carefree, two-month summer vacation in a beautiful villa outside of Paris with his latest mistress, Elsa. Cécile cherishes the free-spirited moments she and her father share, while plotting her own sexual adventures with a “tall and almost beautiful” law student. But the arrival of her late mother’s best friend, Anne, intrudes upon a young girl’s pleasures. And when a relationship begins to develop between the adults, Cécile and her lover set in motion a plan to keep them apart…with tragic, unexpected consequences. The internationally beloved story of a precocious teenager’s attempts to understand and control the world around her, Françoise Sagan’s Bonjour Tristesse is a beautifully composed, wonderfully ambiguous celebration of sexual liberation, at once sympathetic and powerfully unsparing. My Review: If you have not read this book, run out to get it right now! I guarantee you will enjoy this read and will not be able to stop until you have finished. I picked this book up on a whim because of it’s cover, and because it was on sale. I was so happy that I was introduced to Francoise Sagan, who seems to have lived a life like her protagonist Cecile. 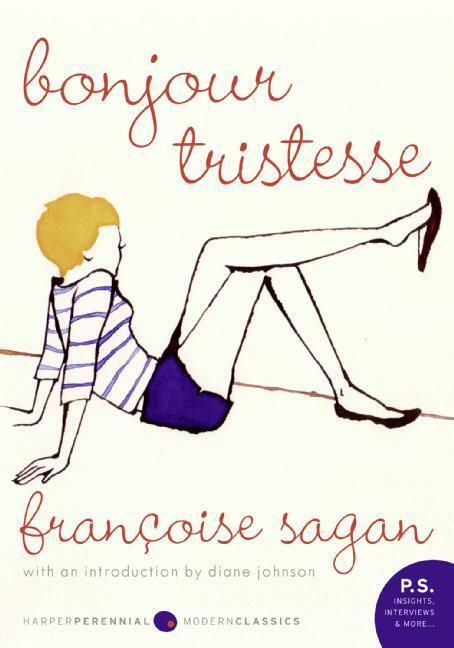 Sagan marvelously wrote Bonjour Tristesse when she was only 18 years old. Upon it’s publication, she was immediately indoctrinated into the Parisian intellectual scene. Bonjour Tristesse translates to Hello Sadness, but I wouldn’t say this novel left me sad or depressed in any way. Posted on August 3, 2010 October 10, 2010 by LN	This entry was posted in A Lisa Favourite!, Classic Literature, Francoise Sagan. Bookmark the permalink.